The program that adds A/B looping to the MPC-HC media player! NEW VERSION! The latest version brings bug fixes and several new features! Check the revision history to see all of the changes! - My program has been tested to work in a bunch of different situations, but it might not work in every single configuration - I'm not responsible for loss of data from the use of Media Player Classic Looper (which should not happen, but... I'm putting it out there just in case). My test system is Windows 7 64-bit (although the executable is compiled as a 32-bit executable - it should work fine on both 32-bit and 64-bit systems) and the latest version of Media Player Classic Home Cinema (MPC-HC). - My program is written in AutoIt - AutoIt programs are flagged by many virus scanners as being malicious - there isn't anything malicious in my program or its code, and it doesn't have any kind of adware, malware, spyware, etc., as part of any of it. The only external piece of code in my program that I did not write is the initial code that connects MPC-HC to the AutoIt script itself, which is basic API calls, and is not in any way malicious. - The very first time you start my program, it will ask you to locate the Media Player Classic executable. It needs to know where MPC-HC is on your computer so it can control it. When you locate it, it will create a small .ini file in the directory the Looper program is stored in, saving the MPC-HC .exe location for future uses (so you don't need to find it every time). If you move the program but not the .ini file, or delete the .ini file, my program will prompt again where to find the MPC-HC .exe file, and will save a new .ini file when it's selected. • Set MPC-HC's OSD to off (click on "Show OSD" in the Player menu, in the Options window, and then re-start MPC-HC) - if the OSD is on, it will show up every time a loop restarts - MPC Looper will work either way, but it's a cleaner loop (IMO) without the OSD reappearing every time the loop starts again. You can also use Looper's built-in OSD to replace MPC-HC's OSD, if you still need some form of overhead display (for example, if you have Looper minimized, and MPC-HC full-screen, but still want to see what position the current file is playing at, you can use that method). • If your loop is not a seamless loop (common with some files, especially AVCHD and H.264 files), trimming your IN point until it starts playing smoothly can help that - just trim the IN point backwards or forward (trimming instructions are listed below, see HOW TO: Tweak IN and OUT points (Trimming)) until MPC-HC starts playing smoothly from the new IN point, then the loop should play more smoothly overall. • If you already have an old version of MPC-HC Looper and an old MPCLooper.ini file, and you want to move the new version into that old folder, it's suggested to either delete the old files before using the new version of MPC-HC Looper, or move them into a different directory, to keep everything better sorted between the two versions. 1 - The top of the window shows the Loop Mode button, the Window Docking buttons, the Always on Top button, the current MPC-HC playback position display and is also the area where you set the IN (starting) and OUT (ending) points for A/B loops. 2 - The section below the top contains the Previous and Next event buttons (which jump backwards and forwards through events in the event list) and the Speed Slider (that lets you choose custom playback speeds). 3 - The section below the Speed Slider contains the Search Bar - a new addition to Looper - this bar lets you search for specific loop events matching a specific word or phrase, and returns only the results that match that word or phrase. 4 - The section below the Search Bar is the Event List, where all of the loops that are part of the current session are listed in the order they were created - new to Looper, you can now sort the event list by name, IN point, OUT point, event duration, file name or chronological order (so if you sort the list in a certain way and want to sort it back to the way it was originally, you can). 5 - The section below the Event List is the Status Bar - this section lists whether the hotkeys are currently on (if either the current session's MPC-HC window or Looper is active), or off (if any other windows are active), and the position of the current playing event (and its duration) in the event list, or a tally of the duration of all of the events you currently have in the events list. 6 - The section below the Status Bar is a series of buttons that let you work with the events list - you can Load and Save .looper playlist files, and Add, Modify and Delete loops from the event list. 7 - Below the event list buttons, on the far left, is the Options button - this button lets you set up defaults for a lot of the Looper settings (including Preview/Slip time durations, the default window positions, Loop Mode setting, Window Docking settings, Always on Top setting, and more) that will load every time you launch Looper. There are many new settings listed in the Options pane, check the guides on the right side of this page for more info on what they do. 8 - The button to the right of the Options button is the Reveal button - clicking on this button will reveal the file that's currently playing in MPC-HC in Windows Explorer. Extremely helpful if you're sorting through a long list of media files and need to quickly find the current one you're on. To clear both the IN and OUT points at the same time, click the Clear All button in the middle, or hit CTRL-X on the keyboard. The IN point will revert to 0:00, and the OUT point will revert to the end of the file that's currently playing in MPC-HC. You can hold down the trimming keys on the keyboard to continue trimming back or forward for a longer amount, for example, if you need to go back several steps. You can also click and hold down the mouse over the trimming buttons on the Looper GUI to achieve the same effect, trimming back or forward for as long as you hold down the button. As you are trimming, MPC-HC will quickly jump back to the section of video that you're adjusting, letting you know where the playback will start or end. This way you can preview where your IN or OUT point will be when the loop starts or ends. • OFF (shortcut: CTRL-1) - In the OFF mode, you can still set IN and OUT points, trim forwards and backwards and add events to the playlist, but MPC Looper will not perform the A/B loop currently set in the program. This mode is useful in logging footage, as it won't immediately snap back to the IN point once it reaches the OUT point (MPC-HC continues to play as if the Looper program wasn't running). • Default - Loop Mode (shortcut: CTRL-2) - MPC-HC Looper will act normally, and play between the current IN and OUT points set in the program. If you double click a playlist event, it will skip to that set of IN and OUT points and delete the ones you currently have. 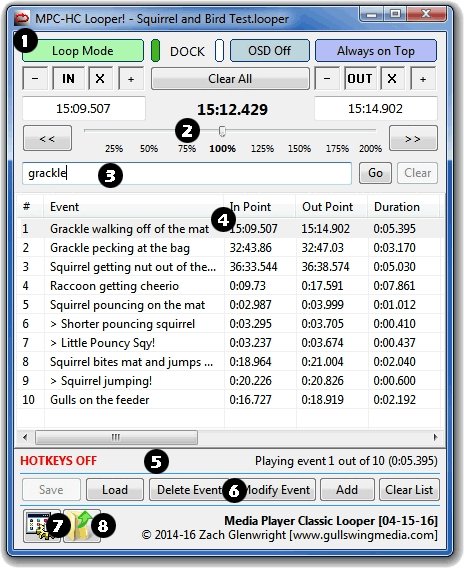 • Playlist Mode (shortcut: CTRL-3) - (available when you have events in the playlist) - In this mode, MPC-HC Looper disables editing of the IN and OUT points, and goes through your playlist one event at a time, playing between the IN and OUT points set in each event sequentially, then moving on to the next set of points (and the next file, if the next event ties to a different file). • Shuffle Mode (shortcut: CTRL-4) - (available when you have events in the playlist) - In Shuffle Mode, MPC-HC Looper will disable editing of the IN and OUT points, and similar to the Playlist Mode, will play through the events list one at a time, but unlike the Playlist Mode, the playback will be randomized (similar to the shuffle mode on a CD player) - going into and out of Shuffle Mode multiple times will randomize the events differently. You can also access shuffle mode by clicking on the Loop button with both the left and right mouse buttons simultaneously. The Always on Top setting determines if MPC-HC Looper is supposed to sit above all other windows on the screen. It is turned on by default, but can be turned off if desired, for example, if the Looper window keeps getting in the way. To turn Always on Top on or off, click on the Always on Top button on the upper-right of the Looper window. When it is on, the button appears to be colored light purple with the text "Always on Top", and the Looper window will sit on top of all other windows. When it is off, the button appears light grey with the text "Not Topmost", and will not sit on top of other windows. You can also save the current Always on Top setting as the default if you choose to (see: HOW TO: Set Looper Default Settings). You can change the playback speed for the current clip (which ever clip is playing at the time), and save speed settings for individual events in the event list. To change the speed, either slide the speed slider (it looks like the picture above) to the left to slow the video down, or to the right to speed it up. You can also click on the individual markers (25%, 50%, 75%, 100%, etc.) to set the playback speed to one of those rates. In this example, the first event will play back at 50%, the next 2 will play back at normal speed, the 4th one will play back at 25%, and the last one will play back at normal speed again. This per-event speed setting works in both Loop, Playlist and Shuffle modes. Clicking on the current playing time in MPC-HC Looper will switch the display to show the remaining time in the current A/B loop. Clicking on it again will switch the display back to the current playing position in MPC-HC. You can also switch between current and remaining time by clicking on the current playing time in the OSD display. and the current playback time in MPC-HC or the remaining time in the current loop. To turn the OSD on/off, click on the "OSD Off" button to toggle it on, or hit SHIFT-O on the keyboard. If you click on the left most docking button, Looper will dock itself to the left side of the MPC-HC window. If you move either the Looper or MPC-HC windows, the Looper window will stay on the left side of the MPC-HC window. If you click on the right most docking button, Looper will dock itself to the right side of the MPC-HC window. If you move either the Looper or MPC-HC windows, the Looper window will stay on the right side of the MPC-HC window. To cancel window docking, either click on the word DOCK, or click on the button that's currently green on either side of the word DOCK. This will disable window docking (shown by having both of the buttons on either side of the DOCK button colored white), and let you move the Looper and MPC-HC windows independently again. Second, to allow multiple instances in MPC-HC, go to the View menu in MPC-HC and click on Options (the last menu item in the View menu). Click on the Player section on the left, then click on Open a new player for each media file played, and then hit the OK button. MPC-HC is now set to allow multiple instances also. With both Looper and MPC-HC set to allow multiple instances, now the fun can begin! You can have multple MPC-HC/Looper combinations running at the same time, looping single A/B loops or playlists independent of each other. You can have one running a tight 2 second loop, as another one is playing a playlist sequentially, a 3rd one running to log footage with the Loop Mode turned off, and a 4th one randomizing its playlist, or any combination of those scenarios. • Double-clicking on a .looper file (if you have them associated with Windows Explorer) will run a new Looper/MPC-HC instance and play the new file in that instance instead of replacing the current one. • Hotkeys work differently with multiple instances running, but in a similar way - they will activate for whichever session has its main Looper window active or its MPC-HC window active. Activating either of those windows will activate hotkeys for that specific session, but for none of the others. To activate hotkeys for another Looper/MPC-HC session, activate either the Looper or MPC-HC window of that session. • To disable multiple instances in situations where you'd rather not have it on, do the same thing you did to turn it on, but in reverse. 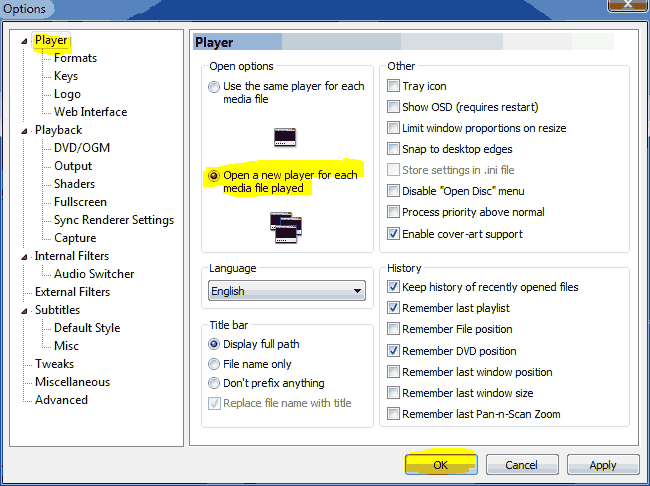 Make sure the Allow Multiple Instances... Looper preference is turned off, and make sure the Open a new player... MPC-HC preference is turned off. With both of those saved, Looper will act in its single instance mode again. PLEASE make sure you have both of those preferences turned ON (or OFF) at the same time to run in either of the 2 modes, because keeping one turned on and the other one turned off could cause strange behavior. Looper has a dialog that pops up if you have multiple instances allowed in Looper, but not in MPC-HC and try to initialize a new instance. The Add, Modify Event and Delete Event buttons let you add and tweak events in the playlist. Add - When you have a set of IN and OUT points that you want to save as an event, click on the Add button, or hit CTRL-N on the keyboard. A dialog box will open, asking what you want to name your loop (for example, "Grackle walking off of the mat" in the picture above) - you don't need to give it a name, but it helps to if you have a large list of loops in one playlist. Modify Event - If you want to modify the name, or IN or OUT points of the current event that's playing (for example, if you tweaked the IN point to start just a little bit earlier and want save that as the new IN point for that loop), click on the Modify Event button. A dialog similar to the Add Event dialog will open, with the name of the current event already filled in. The dialog will prompt you to give the event a new name, which you can change if you wish. Whether you change the name or not, hitting the OK button will modify the current event's IN and OUT points to reflect the new IN and OUT points you currently have set. So if you just want to tweak the IN and OUT points, but keep the name the same, just hit OK when the dialog asks for a new name. If you would like to modify the name or IN and OUT points of another event, double-click the event you want to change in the event list to load it first, and then you can make your modifications to it with the Modify Event button. An alternative to modifying the event is to make a new event with the modified IN and OUT points to seperate it from the original event - I do this sometimes when I want a long loop in the playlist, but want shorter versions of the same loop to keep a tighter version available also. To do that, load an event, tweak the IN and OUT points, and then Add the current INs and OUTs to a new loop. I find it helpful to add a special character at the beginning of the name to differentiate it from the longer loop (I usually add " > " to the name to show that it's a short version of a longer loop, like the "> Squirrel Jumping" and "> Shorter Pouncing Squirrel" events in the playlist above). Delete Event - to delete an event, click the event in the playlist you don't want any more and click the Delete Event button or hit DEL on the keyboard to get rid of it. There are several ways to move events around in the events list - the easiest way to move an event is just to click and drag it to another position in the list. Click on the event (or if you'd like to select a series of events [please keep in mind, they have to be in successive order - for example, 2 through 6], click on the first event you want to select, then hold down the SHIFT button and click the last item you want to select) you would like to move, and then drag and drop it (or them) to the new order you would like them to be in. The # column will be out of order, but that's because you've changed the normal order of the list - if you'd like to restore the original order, just click on the # column to re-sort them. To sort events, just click on the column you'd like to sort them by. You can sort events by name, IN point, OUT point, event duration (NEW!) or filename (by default, the filenames are hidden in the normal view of the event list, but you can scroll to the right to see them). If you want to go back to the original order at any time, click on the # column to re-sort them to their original order. NOTE: If you save your list after you sort it, it will re-save in the order that you've sorted it by. For example, if you sort the list by name, and then save the .looper file, the new order will be the "sorted" order. Saving the sorted list will not change the # column, unless you re-load the .looper file, so you still have a chance to restore the original order if you would like to. Another new feature of Looper is the ability to search for a specific word or phrase in the events list. This is helpful if you have a long list of loops, but only want to show a specific set of them. To search, click on the search field and type in the word or phrase you want to search for (in the example above, "squirrel"), and either hit ENTER or click the Go button. The events list will change color, and only show the events that match the word or phrase you asked for. You can rearrange the search results in the same way you rearrange normal events in the event list (see: HOW TO: Move/Sort Events in the Events List) and even save a partial list of the search results as a separate .looper file. To delete an event in the search, delete it as you would a normal event in the list (see: HOW TO: Add, Modify and Delete Loop Events) - if you add or modify an event when you are in search mode, it will take you out of search mode to make the changes. If you delete an event when you're in search mode, it will also delete the event in the main event list, so keep that in mind. To restore the events list to its original state after a search, click on the Clear Search button - this will clear the search and set the events list back to its normal state. The Save and Load buttons are active at all times - these buttons let you save your current events playlist to a .looper file or load an existing playlist from a .looper file - when loading a playlist from a file, your current playlist is purged and replaced with the events from the .looper file you're loading. The Clear List button deletes all of the current playlist items and reverts the program back to a "new" state - as if it was just opened and there was no .looper file loaded - the currently set IN and OUT points will not be deleted, but everything in the events list will. The Next and Previous Event buttons let you jump between events in the event list one at a time. To load the previous event, click on the << button or hit CTRL-PAGE UP on the keyboard, and to load the next event, click on the >> button or hit CTRL-PAGE DOWN on the keyboard. The first section of the Options Panel lets you set the Preview Time and Slip Amount for the IN and OUT point when you perform trimming operations in Looper (see: HOW TO: Tweak IN and OUT points (Trimming)). The Slip Amount is how much a trimming operation will move the IN and OUT point forwards or back when you perform a trimming operation. By default the slip amount is set to 0.05 (1/20th of a second), but if you need to trim for a longer (or shorter) amount, you can increase the value to a longer (or shorter) duration. Similar to the preview time, clicking on the Save Prefs button will change the slip amount value to the new value for the current Looper session. Now, above when I say for the current Looper session, I mean these new values won't be the default settings. You can save them as the default settings so that new launches of Looper, and new instances (if you have multiple instances turned on, see HOW TO: Use Multiple Instances of Looper) will use the new settings, but to do that, you need to click on the Save Preview Time as default and/or Save Slip Amount as default tickboxes underneath the Preview Time/Slip Amount fields. If you turn those 2 tickboxes on and hit the Save Prefs button, the values listed in the Preview Time and Slip Amount fields will be saved as the default settings for new Looper sessions. If you want to restore the old default settings, untick those checkboxes and hit Save Prefs again, and the defaults will be restored to their original values. Save current Looper window positions and sizes as default will save the position of the current Looper window, and its size, as the default position/size to open new Looper launches/instances. Useful if you want to keep Looper on one very specific part of the screen in most cases. Save current Loop Mode button setting as default will save the current Loop Mode button setting - either Loop Mode or OFF (you can't save Playlist/Shuffle Mode as a default, because Playlist/Shuffle Mode only works when you have events in the events list) as the default mode for new Looper launches/instances. Useful if you want to use Looper as an EDL-style editor (choosing IN and OUT points, but without doing any actual looping), for example, if you want to log a list of interviews, or trim down a bunch of files, it's useful to keep Looper in OFF mode so it doesn't automatically slam back to the IN point once you choose the OUT point. Save current Always on Top button setting as default will save the current setting of the Always on Top button as the default setting for new Looper launches/instances. Useful if you don't want the window to sit on top of all other windows in most cases. Save current Window Docking setting as default will save the current Window Docking setting as the default for new Looper launches/instances. Useful if you want the Looper panel to always dock to the MPC-HC window. Disable tool tips on the main Looper panel lets you choose whether or not to show tool tips on the main Looper panel. With this preference checked, tool tips that would normally show on the main panel will not appear as you hover over things. To turn them back on, just untick this option and save your preferences. NOTE: Tool tips will always display on the Options panel. Allow multiple instances..., turns on the ability to run multiple instances of Looper to load/play multiple playlists at the same time in multiple MPC-HC instances. More on how to use multiple instances is listed above (see: HOW TO: Use Multiple Instances of Looper under the How to use MPC-HC Looper: Advanced section). Disable auto-playing after exiting Looper dialogs sets Looper to keep MPC-HC paused when you exit out of "New Event", "Modify Event" and the Options Panel dialogs. If you have this option checked, exiting any of those dialogs will not automatically start MPC-HC playing again - if you don't have this set, MPC-HC will automatically play when you exit any of those dialogs. Disable auto-playing first event when opening new .looper file allows you to open a .looper file, and load its events into the events list, but instead of automatically playing the first event from the new file, Looper will continue to play the last loop you had set before loading it. With this setup, you can load a loop event from one file, open another .looper file, and then Add the current playing loop (the one still playing from the original file) into the new event list. This option is also useful if you want to see a .looper file's contents, but not automatically start playing from it. If you have both this setting checked and Auto-load the last open .looper file on Looper Launch checked, when you launch Looper, it will load the .looper file's events into the event list, but not play anything until you manually load an event by double clicking on it in the event list. Disable re-open confirmation when closing MPC-HC on its own is a new setting in Looper. In previous versions, closing Looper will ask you if you want to quit MPC-HC Looper or keep it active (if you didn't actually want to quit). In the new version, you get a similar dialog when you close MPC-HC, that, if you choose to re-open MPC-HC, it will open a new MPC-HC window and start playing where Looper left off. Turning this option on will force Looper to act as it did in older versions, where if you close MPC-HC, it automatically tells Looper to quit along with it instead of prompting if you want to quit. Associating .looper files with Windows Explorer allows you to double-click on a .looper file in Windows to open it with MPC-HC Looper. To associate .looper files with Windows Explorer, click on the Associate .looper files button at the bottom of the Options Panel. A dialog will pop up asking if you want to associate .looper files with Windows Explorer - choose "Yes" - and you should now be able to double click on a .looper file in Windows and it will open in Looper. Opening .looper files from Windows works with both single and multiple instances of Looper, but opens a new instance with the new .looper file if you have multiple instances turned on (see: HOW TO: Use Multiple Instances of Looper under the How to use MPC-HC Looper: Advanced section for more on multiple instances). Please don't re-use any media on this site without asking for permission first ~ thank you!